The Empire 120 is another Third Coast kayak that is aimed squarely at angling enthusiasts. 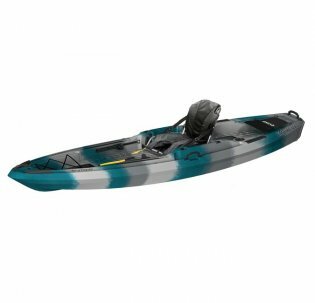 This 12'6" kayak has been designed from the ground up to give anglers plenty of space and it features a width of 35.6" and a height of 14". This means it's got plenty of room for yourself and all your gear and the weight limit is about 500 lb. The only downside to this much space is that the kayak is a bit on the heavy side at 94 lb, which can make it difficult to load and unload on your own. The Empire 120 features an extremely durable construction, but the real highlight is its wide open deck. The tracking is very good and the kayak is also stable enough that standing up is not an issue. To help you stand up, the stand-up strap that is included with kayak is very useful. You won't mind sitting down, though, as the four-position seat system that has adjustable pull straps is extremely comfortable and won't cause back fatigue. For extra comfort the kayak also has the obligatory adjustable foot braces. The best part of the Empire 120 is the amount of storage space that it has. In addition to the very spacious deck, it has rear storage with mesh netting along with front storage that has bungee tie downs. As if this was not enough, the Empire 120 below deck storage as well for stowing items that you don't want cluttering up the deck. Other nice features range from the universal mounting plates to the self-bailing system and sturdy carrying handles. Obviously, with the Empire 120 being a fishing kayak, it comes with fishing rod, rod tip and paddle holders for your convenience. Apart from being somewhat on the heavy side, there isn't a lot that can be faulted with the Empire 120. It is a very sturdy kayak with a durable, yet stable design that also offers great tracking. The biggest selling point is obviously the amount of space that this kayak has to offer, so if you are feeling a bit cramped in your kayak and want to upgrade to something a little more roomy, then you can't go wrong with the Third Coast Empire 120.